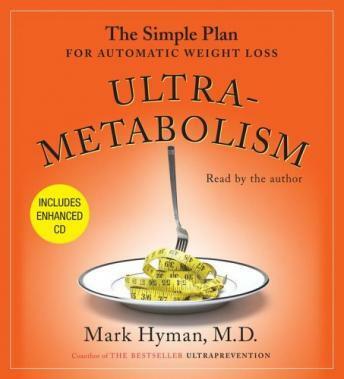 An instant New York Times bestseller, UltraMetabolism finally reveals why it's so hard to lose weight. As renowned physician Mark Hyman explains, our bodies are designed to keep weight on at all costs as a matter of survival. It's embedded in our DNA. Unfortunately, our genetic blueprint has not changed as our diet has evolved; as a result, our bodies are not designed to process the types of food we are fed today. And making matters worse is the fact that diets just don't work; the average person who goes on a diet actually gains five pounds. But now a medical revolution is finally showing us precisely how the powerful forces that keep weight on can actually be reprogrammed to automatically burn fat and keep weight off for good. For the first time ever, Dr. Mark Hyman makes this new science of weight loss available to the general public. This medical revolution is based on a groundbreaking concept called nutrigenomics -- the science of how food talks to our genes. An easy-to-follow eight-week plan to help you lose weight based on your own unique genetic needs, UltraMetabolism is your personal program for permanent weight loss and lifelong health. hmm...I guess I am still expecting a magic cure! Finally admitting for me the cure is no sugar, no flour, no wheat! Not overly interesting to me. Had some good ideas but difficult to keep interest. Also had to skip around to various discs - not easy to do while driving.